Bonnie Kale invited us in to see her sophomores analyze each other's work after the three of us had been talking this year about the purpose of our courses. We quickly realized each of our classes has been getting students to create arguments and defend them with specific pieces of evidence. Another point of our courses to have students know that authors use different approaches to getting their arguments across to the reader. So traditionally we rely on the 5-paragraph paper format because it's easy to teach at younger grades, but we realize it's so limiting as students progress. Bonnie's class was working on getting students to see these patterns and reflect on their own reading and writing. 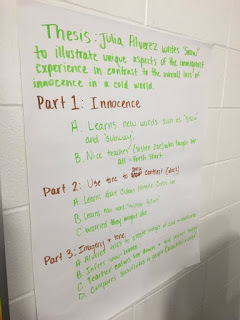 Prior to the class we saw, the students read a short story and created an outline for their literary analysis. 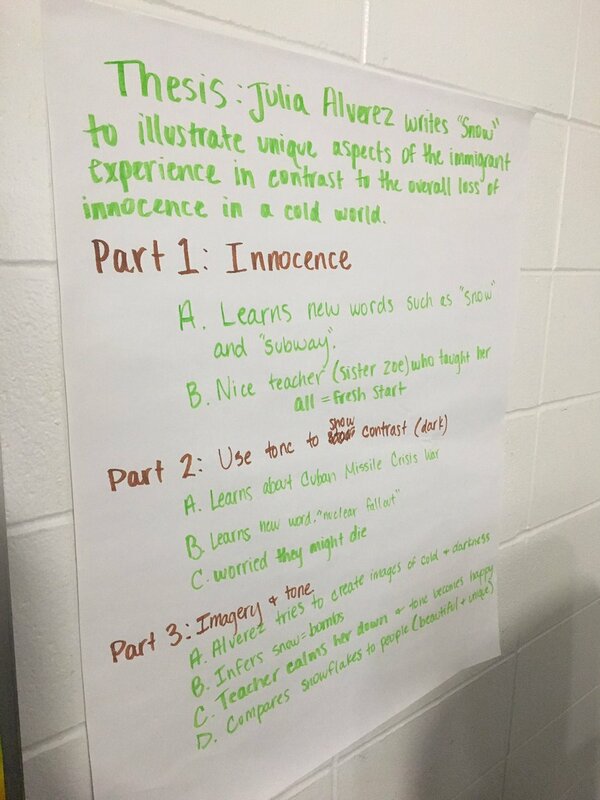 The students were tasked with two things in their literary analysis. For the first task, the students attempted to identify the author's main idea. For the second task, the students attempted to identify the organizational approach used by the author. 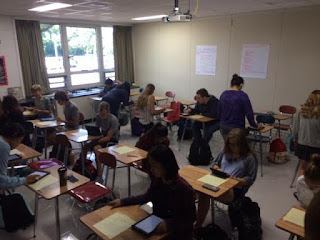 The students had to include both tasks in their thesis for their literary analysis. 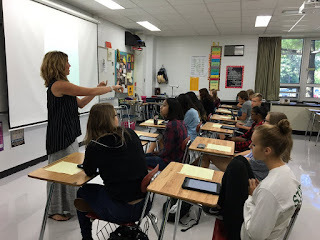 For the lesson, Mrs. Kale wanted students to identify if students completed both tasks. She was not having the students provide feedback to other students. She wanted to see if students could tell when other students completed the task and their effectiveness in the task. The students walked around the room and attempted to see if other students completed the task using a graphic organizer on their iPads. Before allowing students to move on to the actual writing of the literary analysis, Mrs. Kale ensured students knew when they were writing to the task at hand. 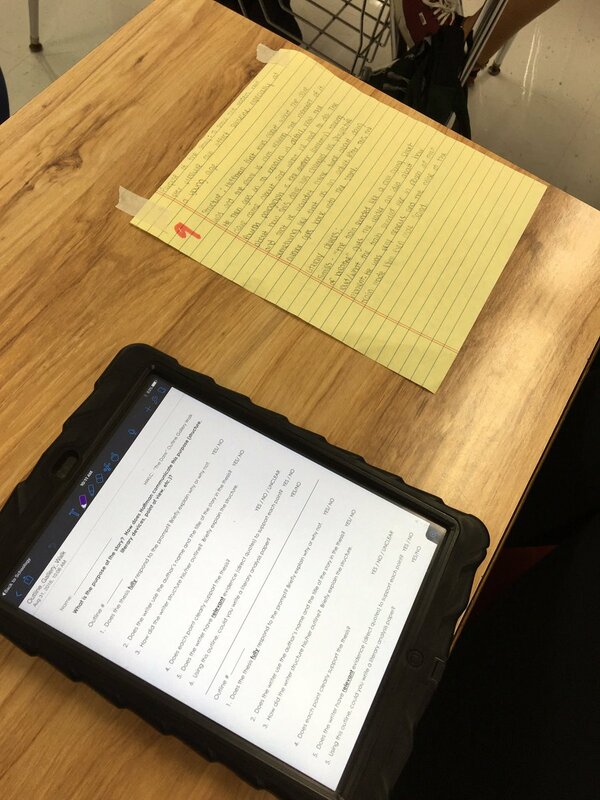 There has been so much overlap in the skill, the students are seeing that they are writing to a specific audience and for a specific purpose. Moreover, they are seeing that authors are writing to a specific audience and for a specific purpose in all disciplines. Some authors are more effective in their argument than others. That same day, all three of us inadvertently focused on the same skill! Hopefully as this year's sophomores move into juniors, they will have more background in the foundational and cross-disciplinary approach to crafting arguments and supporting those arguments with specific pieces of evidence. Thanks for coming in! It's super interesting to hear and see what we're working on! I think that working together as a team is really important and that puts out more great ideas and information. It was cool to see everyone's ideas!